We’ll give the moral to this story first: The SEC is using XBRL and other available data to increase its enforcement initiatives. You cannot control the SEC, but you can control if your XBRL data is catching unwanted SEC attention. RDG Filings can ensure that your XBRL filings are held to the highest standards available anywhere and will not raise flags at the SEC due to poorly structured data. This aggressive investigation is evidence that since the establishment of its Center for Risk and Quantitative Analytics in July 2013, the SEC’s Enforcement Division has increased its use of data analytics to identify potential violations. These types of increase enforcement mechanisms are not a surprise. In October of 2013, Mary Jo White explained that the SEC would be adopting the “Broken Windows” theory to crime fighting and prevention. While they will remain focused on the big crimes, they would use newly available data and technology to more strictly enforce the smaller violations. To repeat the moral to this story: The SEC is using XBRL and other available data to increase its enforcement initiatives. RDG Filings XBRL Quality Assurance Services will ensure that your XBRL data will not raise unwarranted flags at the SEC. 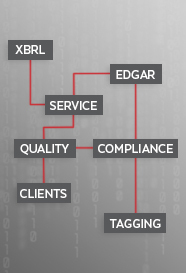 RDG will provide you with an independent, 3rd party review of your XBRL code, and our QA team of expert CPAs will ensure that your XBRL is not simply SEC Compliant, but that it satisfies the most up-to-date and strictest recommendations from the FASB, the AICPA, and the XBRL.US. Contact us for more information. *RDG Filings offers an excellent, cost effective, and user-friendly, web-based tool for the creation and submission of Section 16 Ownership Forms 3, 4, & 5. Please contact us for more information.